Saute the garlice in olive oil over medium-high heat for about 2 minutes. Stir frequently. Once the garlic is golden brown add the kale and few spashes of water. 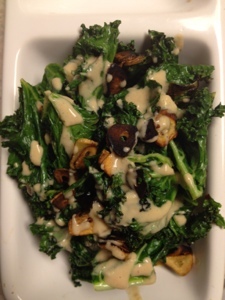 Use tongs to toss the kale around, coating it with the garlic and oil. Stir frequently for 4 to 5 minutes. Serve with a drizzle of Tahini Dressing. Garnish with lemon wedges. This is way more than you need for the recipe above but I figured you'd love it and want to add it to your salad and sammies this week. Place all ingredients in the food processor or blender, and blend until smooth. Refrigerate at leat 1/2 hour in an airtight container.